0 – WHAT HAPPENED ? We did something together : a concert. We want to try to explain it to ourselves : What happened exactly ? How did it happen ? And why ? ... We want to recount the story of the process, but not only that ; we also want to recapitulate all the discussions that took place before and afterwards (right up to the present), articulating the questions posed by the concert – questions that are both abstractly theoretical and very concrete. Our hope is that in doing so, the experience of the concert will allow us to attain a better understanding of the representation of art in art. We are all interested in philosophy. One of us is a professional philosopher interested in music. The others invited him to collaborate on a project. The precise nature of this collaboration is to be determined : he is not a musician and has never participated in any sort of musical performance. He agrees to collaborate but neither he nor the others have any idea what form the collaboration will take. There is something interesting about the sound of words in a musical context – even though most of the time the results are terrible. The sought­after emotion often results from the contrast between 2, 3, or more simultaneous levels of logic, or levels of thought. Thus for example, the commentary which actors provide about their own acting within a film can be powerfully moving : consider Bergman’s A Passion, or the way in which Chris Marker provides a commentary upon his own film in Level 5, or the way in which Sarahang, the Afghan singer, commentates upon his own song within the song (even if one doesn’t understand a word he is saying). This presents an immediate dilemma : three of us are experienced performers­ improvisers ; but if the other is unwilling to perform as an academic theorist – reflecting upon, commentating on, or otherwise providing a second­order accompaniment to the performance – then what exactly is he going to do ? Given that he has abjured all recourse to commentary or speech, there seems to be no other option but for him to somehow perform alongside the others. Mime and tap­dancing having been ruled out, it becomes difficult to avoid the resort to an instrument. But which instrument ? After some hesitation, the choice of electric guitar presents itself for purely practical reasons : there is the dim memory of having being taught the rudiments of guitar playing long ago at school, and even though he has not picked up the instrument since, there is the feeling that he has at least a vague idea of how to coax sounds from the guitar – no such modicum of confidence is possible concerning any other instrument. either. The question is whether this double incapacity can nevertheless yield something besides banality. We take improvisation as an axiom, in the sense that one cannot really define when one is or is not improvising (since so many questions arise around individual free will, subjectivity, and ideology ; questions which we do not think can ever be satisfactorily resolved). By adopting this axiomatic approach to improvisation as a domain to which one can bring ideas, decisions, and concepts as ways of narrowing down or focussing where the improvisation is going to happen, one can look closely into a specific area. In speaking of improvisation, we’re not just talking about the production of particular sounds or events but the production of social spaces as well. We invoke this as both a strategic term and a conceptual tool. Improvisation can therefore refer both to experimental music making as well as mundane everyday practices. But wherever it is applied, improvisation should bring about glimpses of instability. If it works, its elusive qualities should evade solidification and commodification – at least in the moment. The goal would be to apply to whatever discourse one is in the process of articulating those quibbles developed with regard to the world so as to always understand discourse in the exteriority of the world – though ‘world’ is not the right word here ; perhaps it would be better to say “what one ‘is’ not” ? requires taking into account everything happening in the room. It is not just the creation of something new that could be used later elsewhere, but a way of intensifying the moment by changing social relations. Improvisation can be an extreme form of site­specificity as well as a radical, intimate and immanent self­criticality. Since there is no need to defend or construct a position for future situations, improvisation always tends towards self­ destruction. equality, but to produce alternative social relations of time and space. We do not want to be misunderstood. We are not talking about any variant of ‘relational aesthetics’ where a little injection of audience interactivity adds cultural capital to bland artworks executed by very concrete artists with dubious ideologies. Rather, we want to interrogate the limitations of performing on stage : To what extent is it possible to use the parameters that define the spectacle (i.e. the divisions between audience, performer, stage, expectations) as material for improvisation ? The issue about expectations in this concert is important because many people were expecting a philosopher : What would a philosopher do in an improvised music concert ? Something involving speech... But he played guitar instead ­ badly ! To what extent did the tension produced by these expectations influence and intensify our playing ? In the conversations leading up to the concert we talked a lot about trying to be ‘in’ the performance as much as possible. Lately, we have discovered that the way to do this is by pushing towards the borders or limits of the framework that one is working with. These borders, which are often simply accepted without question, actually contain all the problems, contradictions, and conditions that determine the concert situation, but not in any obvious way. One has to deal with them very carefully if one is to be able to identify how they constrain us to behave in certain ways, and the extent to which they affect us. Here we are not just talking about whether or not the room is hot or cold, etc., but about those unwritten yet binding conventions that we comply with out of habit : those rules which are not supposed to be challenged. The simple question often overlooked in improvisatory practice is : How does the social context of the concert frame and limit our scope of action ? a practice that reproduces established conventions or reiterates stereotyped ways of music making, even those accepted as part of what one is supposed to do in order to be recognized as an ‘experimental musician’. Take for example the convention governing the acceptable distance between performing and being in the audience (this relates to the allocation of passive and active roles among performers and audience). If one is performing or has made the commitment to perform a concert, it means that s/he has a proposition, something to offer. But if one’s proposition consists of being the audience, then the risk is that such a proposition will just become an everyday, casual situation. Yet what is arguably most interesting about the concert situation is that it provides an opportunity to create a different social space : people who attend a concert want to be affected, touched ; they want to receive something – or perhaps they don’t ? In which case the performer’s decision not to offer would frustrate the audience’s desire not to receive... Although it is very problematic to accept this passive role, it also provides the performer with the opportunity to do something ‘extraordinary’ ; to create a situation that goes against the grain of our everyday social interactions. The most interesting concerts any of us have played were those where this position and these accepted roles, which both audience and performer inherit from the conventions of the concert situation, become twisted or developed into something else as a result of the audience assuming a more responsible and active role so that they come to believe that they could do anything. for thought for long afterwards (a year and a half in this particular case) ; precisely because it remains difficult to judge whether or not it was a ‘good’ or a ‘bad’ concert in any musical sense. This is what spurs us to try to think ‘in between’ these terms : in this context, a ‘good’ concert would be one wherein any judgement executed in conformity with established dichotomies between ‘good’ or ‘bad’, ‘success’ or failure’, would be absurd. In such cases, extant standards of judgment are suspended and we are forced to question the basis of the parameters by which we judge – previous standards and values collapse. It is not just a matter of dissolving judgement and of liquidating those constraints that allow one to distinguish artistic success from artistic failure, but of ratcheting up the challenge inherent in the ideal of ‘free improvisation’ to the point where it is the very nature of the concert situation that is at stake in the performance. Plinky­plonking is not enough. The plinky­plonk mode of reacting to one another in improvisation is long gone ; our goal is to try to problematise what ‘reacting to one another’ might mean by exploring different ways of almost not reacting as a way of reacting. But the point is not to substitute a ’non­reaction’ for a ’reaction’ ; it is to seek out a mode of reaction or non reaction that would overtake any kind of latent or ’hidden’ imitation ; precisely the kind of imitation that doesn’t reveal itself as an imitation – the latter applies to most of what gets called ’reacting’ in music, whether composed or improvised. might feed the other players, in the hope that everyone might thereby be rendered maximally alert. The goal would be to attain a mode of interaction that would allow each player to appropriate a personalised sense of time : there is a very specific way in which the passing of time is experienced in special concerts, and there was definitely something like this going on in Niort. Just before the concert, while doing the sound­check, there was a realization that we needed to do something about our mode of interaction, since the way we were engaging with each other was too obvious. So we conceived a structure that would impose constraints on our interaction. The concert was going to be 45 minutes long. We divided these 45 minutes into 3 parts, each of them lasting 15 minutes. Each of us could decide to play in one or two parts, but not in all three. But we also allowed ourselves the decision not to play in any of the three parts. So not only was there the possibility of 15 minutes of silence occurring during the concert ; there was also the possibility of 45 minutes of silence should all four of us coincidentally decide not to play in any of the three sections... Of course, for one reason or another we broke the rules, but still this structure generated unusual ways of reacting to one another. playing alone during the second third of the concert’s duration was a very powerful experience. This density was experienced by another in the form of a gamble, not only about when to play, but also about whether to play at all. The possibility of not playing was envisaged as a powerful temptation, since it provided an easy way of avoiding the risk of ridicule that inevitably accompanied the decision to play. This decision assumed the form of a challenge, like the decision to leap from a great height without knowing what lies below. When we began discussing what we wanted to achieve during the concert, we talked about trying to attain a cold or clinical violence. We set ourselves what is, on the face of it, an absurd (not to say dishonourable) goal : we wanted to make people cry. And in fact one member of the audience – unprompted ­ did cry. It might be that this is what happens when the density of the atmosphere becomes too much and is rendered oppressively physical. Why did we want to achieve this ? Because we wanted to do something that would go beyond the production of more or less aesthetically pleasing abstract sounds, the ‘liking’ or ‘disliking’ of which is concomitant with the reaffirmation of one’s musical taste. while abjuring affective stereotypy and the recourse to facile emotional gratification, whether the performer’s or the audience’s. What passes for violence in music too often consists of a series of shock gestures : dissonance, volume, noisiness ; theatrical threats and imprecations... We wanted to try something else : to subject ourselves and the audience to an obscurely unsettling test ; to force them and ourselves out of any recognizable comfort zone by withholding displays of improvisatory craft as well as of musical technique. ‘Violence’, but of a peculiarly studied kind. Obviously, it need not be physical (though this is not to say that it cannot or should not be physical). Often it is psychological and deals with expectations and projections. It is born of the refusal to satisfy the former while interrogating the motives of everyone involved until the level of self­reflexivity is pushed to the point of positive feedback. working with. In the context of free improvisation these might be : craft, aesthetics/taste, certain preconceptions about what it means for performers to react to one another or to the audience, habits that condition and reproduce the concert situation. After one has been thinking through these issues for a long time ; when at last what one wishes to cut or break with has become very clear ; when one is no longer prepared to wait, one turns into a slingshot. Of course, this might entail shattering some of the foundations supporting the values that are taken to be constitutive of an improvised music concert. An incalculable risk has occurred and while this description might sound desperate, there is no desperation involved in such violence. Even when the pressure in question is that of the status quo, once this violence occurs it becomes indifferent to it ; it supersedes it in the simplest way imaginable, as though nothing extraordinary were happening. One might feel as though one were in the dark, but when people are comfortable with the light and someone questions that light, then people become fearful and they perceive the threat of enforced obscurity as violence. This is the sense in which it is a clinical violence. The precision involved is that of the sniper or surgeon cutting through the veneer of normality ; some may experience this as an act of violence but for the idiot it is simply necessary. The scalpel cuts through the foundations that provide the unquestioned or unstated rules of improvisation holding the concert situation together. Unlike the surgeon however, the idiot has no clear goal, nor an identifiable cyst to excise. The importance is in the cut. From there we can all draw our own conclusions. The idiot looks upon reality from an unstructured or uncategorised point of view. His or her intervention is without a foundation : an­archic. There is no general consensus or general understanding : this is the sense in which we are idiots. 1. From ‘having nothing to say’ to ‘finding something to say’ by shifting one’s position with regard to that movement. 2. Around the question of the concert, music and philosophy met, without knowing why. In any case, we wanted to change something about it. 3. We exchanged ideas about “what a concert is” in order to find an efficient practice, mainly by defining what we would not like to do in any given concert. 4. The conventional frame of the concert was thereby displaced (which would have created possibilities for the opening of vision and for a renewed listening). Nevertheless, we did not know what we might do. 5. By putting this in parenthesis, we performed a kind of concert, a non­ concert. But in any case, what is the relation between A and non­A ? feel, react, and reflect : the experience of not feeling ‘ourselves’ anymore (don’t we feel too tied and sometimes even imprisoned by our professions ?). 8. The profound silence within us, filled with the immense energy that threatens to explode when blocked : this unnameable zone would be the basis of our experience with language. There we were. 10. Once the non­concert was finished, our work began again, and we had to try to put this unsayable experience into words. This text is part of that attempt. 11. To dare to do each time without falling into routine, in order to renew, to stimulate, to dynamize the everyday. We think there is a particular relationship between the NON of Derek Bailey’s ‘NON­idiomatic’ and the NON of François Laruelle’s ‘NON­ philosophy’. NON­philosophy is the theory or science of philosophy, treating philosophy as a material. NON­idiomatic playing is supposed to be able to treat all music as a material. Of course, one can understand Bailey’s statement as one strategy among others to affirm an individual position in the music world. But although these kinds of strategies are usually simple (and sometimes stupid), the non­ idiomatic one seems to us to be very dynamic and full of interesting questions and problems – even if Derek Bailey is not necessarily the best exemplar of his own idea (but isn’t that the sign of a good idea ? When one’s idea or theory completely overtakes one’s practice or subjectivity ?). There is a similarity between the trajectories of Laruelle and Bailey : they seem to be engaged in trying to free philosophical and musical practice respectively from their institutionalized idioms. Both have very similar relationships to their own historical background. ‘NON’ as a prefix means that you are not part of something but dealing with it from some kind of exteriority ­ yet one which involves the immanence of practice rather than the transcendence of reflection. As a negative prefix, ‘NON’ also means that you are supposed to have some kind of immanent general point of view : not from above but from within the practice of music itself ­ the most immanent point of view possible. It entails that you add a layer of representation such that it either subtracts the previous layer or even unifies all the layers. philosopher is never just talking about this object, but also about how every other philosophy mediates her relationship to this object. Non­philosophy represents an attempt to ascend beyond this level of reflexive mediation while simultaneously descending beneath the level of irreflexive immediacy. It does this by operating in the medium of what Laruelle calls ‘real immanence’ : this is an immediacy that is radically irreflexive, but one that generates a kind of pure practical transcendence (mediation through practice rather than theory). ‘Real’ as opposed to wholly idealised or conceptualised immanence boils down to the question of the use of theory : the real immanence evoked by Laruelle entails a strictly disciplined practice of philosophy. Instead of exacerbating reflexivity by ascending to a meta­metalevel, non­philosophy adds a third layer of auto­reflexivity that is also a minus (an a + that is a ­) – a subtraction that allows us to view all philosophy from a vantage point that is at once singular and universal. Mediating abstraction is concretized and unified through a practice that, as Laruelle puts it, allows it to be ‘seen in­ One’. This is not some mystical rapture but a practical immersion in abstraction ; a concretization of theory that precludes the sort of play ‘with’ different philosophical idioms indulged in by postmodern ironists. We brandish the NON as the marker for an incapacity that adds a layer of knowing and subtracts a layer of self­consciousness from reflection in such a way as to eliminate complacent gestures of reflexivity : the player’s knowing wink to the audience (“you know that I know that you know...”). NON rescinds the complacent reassurances of such ironic distancing by driving an inalienable wedge between the player’s intellectual and affective capacities and his technical craft : it pits practice against craft in a gesture of uncrafting. the typically postmodern gesture of ‘playing with’ idioms. NON supposes the impossibility of any second­order discourse ‘on’ music ; it indexes the impossibility of interpretation : one may view all the music of the moment through the filter of electroacoustic music ; one may also view the viewing through the window of improvisation. We postulate an equivalence between NON (‘non­philosophy’/‘non­ idiomatic’) and UN (‘un­conscious’/‘un­craft’). Both are about releasing the potency proper to impotence, the capacity proper to incapacity. The practice of uncrafting does not just imply the negation of technique, but the unleashing of a generic potency proper to incapacity, of which technical/practical capacity would be merely a restrictive instance. Our performance in Niort pitted uncrafting against the aestheticisation of improvisatory technique. The latter results from the tendency to abstract the sonic or auditory dimension of performance from its non­aesthetic envelope, exemplified by the social framework and the concert set­up, and to grant pride of place to sound according to the aestheticism of the ‘pure’ listening experience. In doing so, free improvisation risks degenerating into an aestheticism of technique in which the skill exhibited by the free­ improvisation virtuoso is fetishised just like that of the idiomatic virtuoso. The immanent critique of aestheticism will not be accomplished by collapsing music into ideology or injecting it with an extra layer of self­ consciousness. It is rather a question of levelling the hierarchical difference between immanent practice and transcendent theory by re­implicating theory into practice but in such a way as to precipitate a crisis wherein convulsive conception interrupts complacent sensation. The goal would be to effectuate a critique that no would longer depend on the security of critical distance ; a critique that would remain inside. This would no longer really be a critique but rather the discovery of an outside through the inside. Representation can be envisaged as a thousand­layered cake (mille­feuille), each layer being re­injected into itself and more or less into the others (there being a more or less powerful filter between the output of one layer and the input of all the others). To be able to situate oneself relative to an idiom is to take up a position within the thousand­layer cake ; to work through the question is to operate upon the thousand­layer cake while forcibly subjecting it to an irremediable modification : here, the interaction with the object is particularly dynamic (even requiring some security measures) – whether to lose or not to lose one’s accent (but what is the absence of accent) ? The question is whether representation is a flattening out from below or levelling out from above ; which is to say, an elevation... The ‘reality’ of influence in an improvisatory context consists in acceding to one less level of representation (this is the reality of synchronicity). Things happen and are as little represented as possible. flux/afflux/influx of data and signs generated by the form of the work ; since the latter is itself a particular point within a huge flux of data and signs. Rumour is the claim that a piece of art cannot resist the flux it generates, and of which it is made. The problem then would be to bend a previous flux towards another one in such a way as to prevent the piece from being rendered transparent to the flux : transparency = YES ; work = NO. This is not to say that a work should be more conceptual than material : it could still be anything, and even more (or less) than anything... Of course, what we are calling ‘rumour’ could be designated differently since the word’s semantic proximity to ‘gossip’ could invite misunderstanding. But we think this proximity is or can be important : consider the history of art, or the debates and commentaries surrounding any artistic event, including those promulgated by the so­called artist herself. Nevertheless, according to this logic, every work of art would be a way of saying NO to rumour, all the while knowing that rumour makes its living from every such NO. This would mean that the shape and the process of the music have something to do with the shape and process of the rumour surrounding the music itself – even if rumour is also a way of resisting. In the context of composed music, the influence (among other factors) is often represented as something that happens to sound as something subsisting in itself. children’s playing. This is not to say that ‘real’ in its everyday adjectival sense doesn’t harbour a powerful but complicated connection with the real as noun, whether Laruelle’s or Lacan’s. Criticism, in art, or of art, invariably consist in superimposing a layer. This layer could be described as follows : it transforms everything into the theatre of its own representation, even in those cases where everything is already theatre. In other words, the indication of representation has always already been accomplished and yes, it is always being forgotten. To indicate representation is to frame the frame : a doubly redundant gesture. Ultimately, critical distance ends up converting everything into fodder for sociological analysis and an object of the human sciences (the latter amounting to a grotesque caricature of what is most distinctive about the scientific stance). Being aware of the fact that you represent the art you are supposed to create is simply the engine that drives any historical process in art. NON : the trap consists in believing that the contemporary is always the ultimate ; that it is contemporary with us ; that it is our contemporary : that we are contemporary ! To break history in two, to want to do so, to declare it by doing it, is already a sign that it is not being broken, that one is just praying... The impossibility of a discourse ‘on’ ultimately entails that of a discourse ‘with’ or even ‘in’ : all that remains is discourse’s feedback, re­injected into itself (and what this cry renders possible relative to the cry/non/...) : a discourse re­injecting itself into itself on the pretext of having to integrate its own conditions of possibility. is, but it tends to repeat the same lesson over and over again : “Either there’s no material, or one must redefine it to obtain a radically new sense of what it is”. But we are always already implicated in the material because there is no possible position from which we could obtain an ‘objective’ vision of it as a whole. The latter is of course precisely what the concept of ‘material’ presupposes ; but it does so because it assumes the transcendence of vision (and hence a veritable exit from the blind immanence of the real). Of course, non­philosophy’s claims with regard to its material is that such an immanent posture can be realized without exiting from the element of radical immanence that is constitutive for its thinking. Nevertheless – and it is our conviction that this is what art teaches us – the taking up of the material in immanence entails the end of the material : we exit from the semantic field concomitant with the name ‘material’. There is something incompatible between the NON and the material. The proposition “Every music is idiomatic” is the affirmation of a point of view rather than an affirmation about the music itself. It says a lot about who is saying it and nearly nothing about the music itself. By way of contrast, the proposition “It is possible for music to tend towards the non­idiomatic” says a lot about what music’s inner dynamic might be. To believe that, regardless of all your efforts, whatever music you produce will always be idiomatic is to assume that you have a point of view from above, an aerial perspective or a kind of general map of all existing and possible musics. It is to assume that your playing or composing or performing is unfolding on the basis of that map, as an immediate part of it – that you are playing with or on that map. To integrate one’s self into the idea of a non­idiomatic music doesn’t mean that one is without such a map ; it means simply that one’s self is not located in the same place in one’s intellectual activity and in one’s artistic practice. On another level, this can also mean that what one considers to be an idiom is simply the set of influences, imitations, or authorities from which it is possible to generate any musical proposition. This is an all too historical point of view, in the most impoverished sense that history can assume. The human being does indeed seem to be the greatest imitator among all the animals we know. To then go on to claim that “all music is nevertheless idiomatic” is to point out this imitative skill. But to say “music can tend towards the non­idiomatic” is not to assert that one can, as a musician, operate apart from any imitation or influence ; it is merely to point out that it is possible for music to occur independently of any play upon those relations ; or that music itself provides a powerful vehicle from which one can attain a critical point of view upon what could be called the prison­ house of self­referential imitation. Quite apart from anything else, the impetus towards the non­idiomatic prevents improvisation from lapsing into a series of private jokes and the citation of musical references only a select few could properly appreciate. Question : How can someone imagine that their own speech is unaccented ? Even a non­idiom is idiomatic ! But the tendency towards it (or the vis à vis) is a very specific energy that provides a powerful source for the music, as for example, in most of those cases that prevent one from playing on or with genre as established forms, through the affirmation of a total incorporation of the musical experience into the interiority of each musician. What is culture ? Something like a very resistant core of knowledge that one can’t help having anyway, and that one has to deal with in every day life (without having to know about this knowledge). But music is never completely idiomatic : non­idiomatic playing is playing that does not seek to represent what one thinks music should be or how music should work. In this regard, idiom itself is radically a­subjective. It becomes subjective when it becomes the representation of a particular idiom : this is music as idiocy... It’s a question of inserting the idiocy of the real into human being : you don’t choose to have the accent you have but you can work with or against it. A non­idiom is an ingenious way of separating music from linguistic metaphors and of insisting that “No, music is not a language”. One never notices one’s own accent in one’s own language. There is something programmatic about the very idea of the non­idiomatic : to impose a name on a practice is not necessarily to describe what it is in the name of some (short­sighted) pragmatics ; it can also serve to name the dynamics of this practice – partly no doubt in the name of some sort of vitalism, but also, quite possibly, of a profound dialectic, inaugurated by the nomenclature itself, between that which is the result of a given practice and that which is its motor (where practice and theory are one and the same). NON is what gives force to this dialectic. There is on one hand the decision to do this rather than that (knowing why one is doing so) ; but there is also the inability to do otherwise (and even to regret it). Nevertheless, non­idiomatic means quite the opposite. Non­idiomatic presumes that in a modern or post­modern culture one can’t inhabit an idiom without having a strong representation of it. This means : one can’t play in an idiom without (somehow) having the feeling that one is representing that idiom (showing an image of it). Furthermore, one can’t really inhabit one idiom alone ; one also has to know more or less about many other idioms... This means that one has the possibility of an aerial point of view. An idiom presumes a simple knowledge that may be as profound as possible, but which is not supposed to engender knowledge of this knowledge. To have a representation of the idiom is to presume that one possesses knowledge of its knowledge (that one knows that one knows it). Popular culture is supposed to ‘be’, without representing itself (that’s why, at the simplest level, pop­art is not popular). But ‘non­idiomatic’ means : to play minus this second­order knowledge about what one is playing. Thus, since all idioms are representations of themselves, the task of the non­idiomatic musician would be to escape from the representation of music in music. this regard, non­idiomatic music would be a way of producing what should be popular music ; which means that it’s not popular music. There’s an ‘as if’ at work here but one that is not of representation : “I play what I play, where and when I play it, knowing what I know, as if I were a real popular (i.e. ethnic which is not to say ‘popular’) musician”. Thus the non­idiom supposes an ‘as if’ that is close to the one scientists use with regard to their own work : “Every thing happens as if...”. It’s strange that popular means ‘well known’ rather than ‘ethnic’ (rumour again). The only way to produce something like a ‘popular music’ would be by being a non­idiomatic musician. Non­idiomatic = popularity against the popular (idiom against fame). Yet doesn’t the fact that improvising musicians are supposed to be able to play with any musician in any context mean that their non­idiom is in fact a ‘super­idiom’ that includes all others ? No : by adding a layer that is a ‘minus one’, NON precludes the idea of a super idiom. The immanent ‘One’ indexed by Laruelle’s NON is precisely not­All. In the last instance, to be a non­idiomatic musician is actually to be a contemporary idiomatic musician. Why does society need free improvisers ? We are little entrepreneuriats ; very good at managing ourselves and acting as our own little bosses and workers, producers and consumers. There is a sense in which the improvised music context provides a little laboratory prefiguring capitalism’s future development, since being an improviser requires many of the characteristics prized by the capitalist economy : self­motivation ; strong individuality ; hyper flexibility and adaptability ; the ability to adapt quickly to different circumstances ; the ability to perform in public (for customers) ; constant self­ promotion (look at my individual qualities, my particular way of playing my instrument : what I provide is something that you cannot get elsewhere). For all these reasons, we think it important to try to reconnect free improvisation to the politically engaged atmosphere in which it emerged in the 1960s. This is necessary in order to understand the connection between the development of capitalism and the ideological shifts from the historical moment of free improvisation’s original inception to its current status in contemporary capitalist culture. 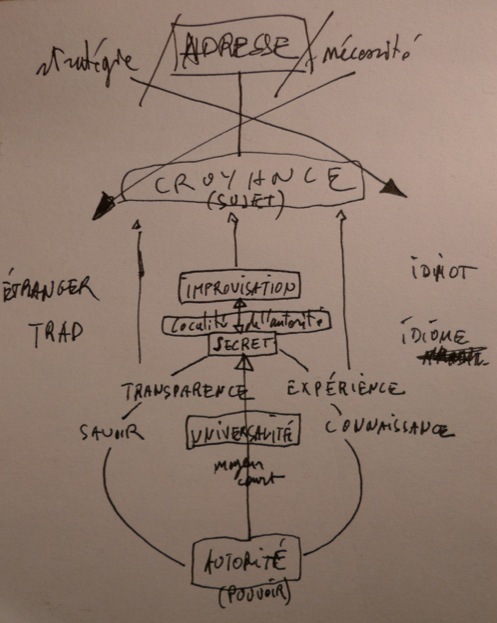 We need to grasp why previous leftist perspectives on improvisation failed to recognise the problems that this practice harboured (such as the fact that the free improviser provides a model of the ultimate capitalist) ; we need to expose the Romantic idealisations that generated this political myopia ; and we need to understand why improvisers often promulgated such excessively crude and over­ simplificatory accounts of the political potential of improvisation as a form of praxis (assuming of course that free improvisation does in fact harbour a progressive aspect, which we think it does). Let us consider the political subtext implicit in the concert set­up in relation to the theatrical machinery of representation. Brecht’s Verfremundungseffekt (poorly translated as ‘estrangement effect’) tries to eliminate the fourth wall in the theatre by distancing and disrupting the illusion separating the audience from the stage and performer, rendering evident the audience’s ‘passive’ and ‘alienated’ condition. This in turn is supposed to make the audience understand how artificial the situation actually is. In improvisation, the estrangement effect is doubled, for the condition of the performer is also disrupted. Since both the performer and audience find themselves in a condition that they could not have previously anticipated, the separation between them is no longer so clear. Question : Right now, whatever situation you find yourself in, how much would you be willing to give up ? The point of triggering a dense atmosphere in improvisation is to reveal the conservative construction of the situation (one that involves the audience, the performance, the manager, the curator) and to produce the desire for a new set of conditions. There are no prescriptions for improvisation. The goal is to create an unprecedented situation ; one that is strange for everybody ; without a didactic or prefabricated agenda. In his text ’The Emancipated Spectator’, Jacques Rancière uses the example of Joseph Jacotot, a 19th Century French professor who tried to teach his students what he himself did not know. In doing so, Jacotot took as his starting point the equality of intelligence, negating claims to epistemic mastery. In Rancière’s words, Jacotot was “calling for intellectual emancipation against the standard idea of the instruction of the people”. Performing the authority of knowledge (like Debord’s criticism or Brecht’s didactics) reproduces the logic of mastery, even as its deconstruction is intended. consciously mitigating one’s own immersion in it. The goal would be not so much to oppose performative immediacy to interpretative mediation, but to identify the point of indifference between knowledge and ignorance, capacity and incapacity, and to occupy it in such a way as to convert their indistinction into a focal point concentrating the most explosive contradictions of the situation. Estrangement and idiocy. If one becomes (or comes to be) a non­idiomatic musician by being aware of the fact that idioms are a representation of idioms, then to become a non­ idiomatic musician would be to become a (super)stranger (in the same sense as Whitehead’s subject is a ‘super­jet’). If one becomes (comes to be) a non­idiomatic musician by pushing one’s own accent to an extreme, then to become a non­idiomatic musician would be to become a (super)idiot (in the same sense as Whitehead’s subject is a ‘super­jet’). Basically, the stranger is the one who has ‘another’ idiom, while the idiot is one who has no idiom or an exclusively idiosyncratic one : if the idiot has an idiom, that idiom will be used only by him/herself. the sonic world as one sound and/or the sonic world as one information. ‘Super­stranger’ = ‘solar stranger’ in the sense that this stranger casts light upon idioms (sun). ‘Super­idiot’ = ‘nyctalopic idiot’ (one who sees in the dark), in the sense that this idiot has his/her very own idiom, and can speak in a non­speaking environment (s/he creates light for her own sake in total obscurity) : s/he speaks with a non­linguistic instrument. II, non­language = the pre­linguistic state, historical yet always actual within us, rooted in solitude, silence, and depth ; under the sway of the interminable and the incessant (Blanchot) : the background noise : Levinas’ ‘there is’, non­ language possesses the force and potential to overcome the impossible (bringing about the creation of language). III, an inconceivable impetus from non­language to language. Man’s creation of language was driven by his need to socialize himself, to communicate with himself, and to live communally. IV, language : segment ; formulate ; organize. A saturation of language results in its dysfunctioning, its death : if everything was formalized, it would be too much. Language requires an injection of non­language in order to open up, breathe, and maintain its equilibrium. VI, the non­idiomatic according to Derek Bailey : to distinguish oneself from those instances of idiomatic improvisation encountered in the history of music. stereo phenomenon, hi­fi, etc.) They dissimulate reality. IX, the subsequent or contemporary generation as antithetical tendency : The musical exhaustion, the boredom that crept up little by little from the first generation, on account of our evolving ears, created a motive force for a radical change from one music to another. Now, in place of speed, slowness. In place of change, the quest for depth. The question of listening is more focused than that of musical games ; or perhaps the former is determined by the latter : feedback. A particular attentiveness to a non­linguistic aspect, in a way that differs from that of the previous generation : silence. Varied and subtle strategies are required in order to tame language and non­ language, while at the same time evading their captivity : it is a matter of delicate balance : not too close, not too far. One must await the arrival of a sound by plunging into sound or silence, by hearing the interminable and the incessant. There is no longer an author. For this generation, non­idiomatic could take on a new meaning : non­ idiomatic music frees the listener’s hearing because it does not oblige him to acquire any musical idiom or syntax in order to understand it. Non­idiomatic music is addressed to personal listening rather than to a collective listening rooted in the notions of categories and idioms. X, our strategy straddles two paths (language and non­language) : it is important not only to question the actual system surrounding music from a political, social, cultural, etc., viewpoint, but also to propose a radical music capable of unmasking the hegemony of music as language ; it is from non­language that music derives its essential force, which renders it capable of overcoming difficulties and of going beyond itself.